Blurb- Seasons keep on changing around us every few months. Our relationships too change the same way all through the year. There are ups and downs, estrangement, loneliness, a sense of foreboding, misunderstanding, but then again, if your love is true, you can cross all hurdles, overcome your differences and be right back in each other's arms. And when that happens, it isn't important which part of the year it is, because for you two, it's of course, the "Season of Love". This book presents short stories and poems on different aspects of love from 15 talented young authors. So, come, flip through the pages and get ready to fall in love all over again! 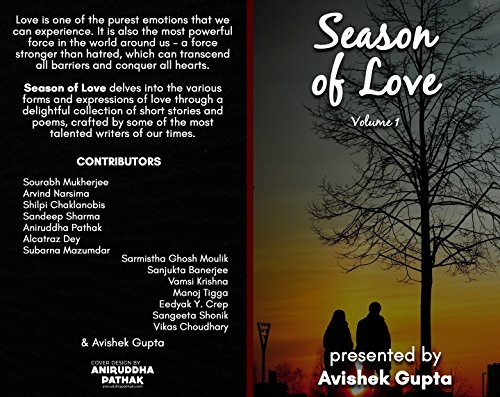 Review- Season Of Love is Anthology fiction presented by Avishek Gupta and it contains 15 different short stories and poems showing different colours and elements with suspense twists and different emotions. It was light, interesting read and I completed the book in one go. Book Title and Cover- Book Title " Season Of Love- Volume 1" is intriguing and hints us about the content. Cover is beautiful and comprises of different colours which shows us different stories and emotions. All in all, First Impression of book catches attention of readers. Language and Narration- Language of the book is simple and easy to comprehend. Narration is decent and hooks readers with the book. This book has power of binding his readers with the book with simple language yet interesting stories. I completed the whole book in one sitting.